TIRUN, the exclusive India representative of Celebrity Cruises, recently announced the launch of Celebrity Edge, the first-of-its-kind ship in Celebrity’s Edge-class fleet. 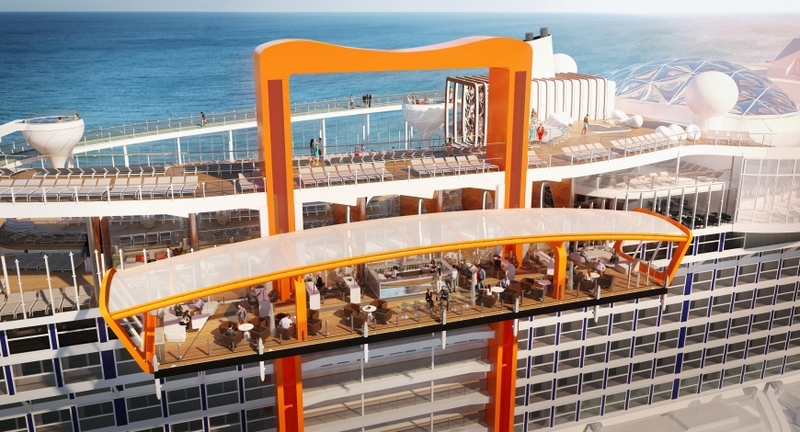 Celebrity Edge promises to change cruise experiences for travellers across the world. The epitome of modern luxury cruising, Celebrity Edge features an array of services, amenities and features hitherto unheard of in the world of cruising. The futuristic ship with a gross registered tonnage of 129,000 tonnes can accommodate 2,918 guests at a time and offers cutting-edge design envisioned by world-renowned interior designers such as Kelly Hoppen, MBE, Tom Wright of WKK and award-winning interior designer Nate Berkus. The entire ship has been designed in ultra-modern 3D technology.The design team also consists of talented individuals who are new to the world of cruise designing and have specifically chosen to break the conventions and give the ship a truly edgy look, reflected in its unique outward-facing design! The ship features exciting innovations like the Magic Carpet, the world’s first cantilevered, floating platform that keeps changing its position to offer breathtaking views to guests. It goes up to 13 storeys,and keeps intuitively changing its location on the ship throughout the day to help travelers enjoy the most beautiful, and ever-changing moments on sea! 80% of the staterooms are equipped with Infiniti Veranda, a feature that enables guests to transform their entire living space into a balcony opening out into the vast ocean, all with the touch of a button. With Celebrity Edge, Celebrity has more than doubled the number of available suites, adding two spectacular new categories. At the top of the line are two new Iconic Suites situated above the ship’s bridge. These near 2,600 sq ft, two-bedroom, two-bathroom suites feature mind-blowing views thanks to panoramic windows enveloping the dining room, living room and bedrooms. The 700 sq ft veranda offers a 270-degree view of the ocean. Another new Suite Class comprises six split-level Edge Villas, which offer stunning views from two storeys of windows, private plunge pools and direct walk-out access to The Retreat Sundeck. The state-of-the-art spa, sprawling over 14,000 sq ft, with an accompanying gym and café covers 22,000 sq ft and offers a wide variety of treatments and facilities that will help guests foster a deeper connection with the ocean. The spa will offer 124 treatments including a Zero Gravity Wellness Massage,Restorative Salt Stone Massage, and Thousand Flower Detox Wrap. Featuring a private pool and a lounge and an exclusive sanctuary designed just for Suite Class guests, The Retreat is the ultimate indulgence on-sea, featuring verdant spaces to just laze on and enjoy the sea and the sun. With 24X7 butler services, exclusive Suite Class restaurant Luminae@, The Retreat is an experience whose charms are very difficult to shake off! Celebrity Edge will homeport in Fort Lauderdale, FL, and is scheduled to make her first sailing in December 2018. True to the heavenly experience it promises to offer on board, the ship will make its first sailing to the islands of paradise in a 7 & 10 night Europe sailings visiting the ports of San Juan, Puerto Rico, Tortola, British Virgin Islands, Key West, Florida, Naples/Capri, Mexico and George Town, Lisbon Portugal, Ibiza and Valencia Spain, Grand Cayman, with AND sailings to Europe set to begin April 2019 onwards.